New treatments for the hundreds of disorders that affect the brain are too few and far between. One reason for this lack of treatments is that we do not yet understand how the brain and nervous system work at a fundamental level (see our recent blog post about the need to support basic science). In addition, when potential treatments for nervous system disorders are discovered in the laboratory, researchers in academia often lack the expertise and access to critical infrastructure required to develop a new drug, biologic agent, or device to the point where the biotech/pharma industry will pursue it further. Compounding the problem, and reflected in statistics for pharmaceutical development, is that treatments for brain disorders have particularly long clinical development and approval times (8.8 years) and a low clinical approval success rate (~8%). With such deep risks in terms of time and money, pharma has dialed back early-stage investments in drug development for neurological diseases, despite the large number of people affected who urgently need new and better treatments. Taken together, these factors mean that the clinical application of many promising potential therapies is never fully explored. NINDS has supported researchers through the discovery and preclinical phases of therapeutic development with several research funding mechanisms, including those developed by the Institute’s Office of Translational Research (OTR). Recognizing the need to play a bigger role in bridging the gap between the discovery of a potential therapy and its development and clinical testing, NINDS staff thoroughly assessed the strengths and weaknesses of our existing programs. Based on that assessment and in consultation with the community, NINDS has just launched three carefully crafted funding programs, each tailored to specific treatment modalities—the Blueprint Neurotherapeutics Network for small molecules, CREATE (Cooperative Research to Enable and Advance Translational Enterprises) Bio, and CREATE Devices. These new milestone-driven programs offer support for preclinical development and potentially small clinical trials and allow researchers in academia and small companies the opportunity to play a more active part in translating their basic neuroscience discoveries into treatments. We hope novel therapies advanced through these programs will become attractive enough to hand off to biotech/pharma companies, which can then lead later-stage development and testing and ultimately produce treatments approved for use in humans. Over the past few weeks, NINDS has rolled out 12 funding opportunity announcements (FOAs) for these three programs (for more details, see links and program descriptions below). Because the programs are split into multiple tracks (including discovery, development, and small business tracks), each program includes multiple FOAs. The Blueprint Neurotherapeutics Network (BPN) focuses on the development of small molecules, i.e., drugs that are small enough to reach the circulatory system and in most cases cross the blood brain barrier. This program provides investigators with support for their research as well as the opportunity to work with a range of consultants and access to contracts that provide discovery, preclinical development, and clinical trial support. NINDS program staff serve as scientific project managers and work closely with the investigators and the industry consultants and contractors who offer the particular mixture of development tools and services needed to advance each project. The CREATE Bio and CREATE Devices programs provide funding for the development of biologics (including proteins, peptides, nucleic acids, gene and cell therapies) and devices (including implants, stents, and prosthetics), respectively. A key aspect in filling gaps between making a discovery at the bench and advancing therapy development to industry partnership or hand-off is providing support at all points throughout the process. The BPN and CREATE programs offer multiple entry points along the development pathway, beginning with discovery for the BPN and CREATE BIO programs and picking up after the initial discovery phase for the CREATE Devices program. All three programs also offer additional entry points through preclinical development to small clinical trials. Recognizing that the therapy development process is inherently risky, NINDS staff will work closely with investigators to create realistic milestones and ensure opportunities to achieve them. In cases where milestones cannot be met, NINDS will bring projects to an early close, and if appropriate, encourage researchers to use other funding mechanisms to explore the basic science required to develop a new therapeutic hypothesis. This approach will allow the CREATE and BPN programs to concentrate time and resources on the most promising projects. In the coming months, we will be redesigning our current translational R21 program to support early-stage projects with the goal of successful entry into the CREATE and BPN programs discussed here. Check back with this blog for more details. To learn more about BPN, CREATE Bio, and CREATE Devices, check out the links below. We strongly recommend contacting NINDS program staff at least 12 weeks prior to grant submission to discuss anticipated projects and budgets. The Blueprint Neurotherapeutics Network was initially launched in 2011 as a 5-year, $50 million program. The program provides funding and a nation-wide “virtual biotech” network of contractors and consultants with extensive professional drug discovery and development experience to support the following aspects of therapeutic development: medicinal chemistry, data management, pharmacology and toxicology testing, formulation and manufacturing, bioactivity/efficacy studies, and Phase I clinical trials. Several of the initial cohort of 15 Blueprint projects have advanced through early milestones and have reached at least the proof of concept phase. Continuing the success of the Blueprint Neurotherapeutics Network, the program has been expanded and modified. The new funding announcements feature more flexibility by offering a flexible mix of grant support and contract access. Some investigators have substantial experience in therapeutics development and access to facilities to conduct all the necessary studies, some investigators have none, and others fall somewhere in between. Investigators can choose the combination that best fits their needs. Blueprint has also added an SBIR track funded through the U44 mechanism for small companies. To help navigate the expanded choices now available in the Blueprint Neurotherapeutics program, NINDS program staff will work closely with applicants to help them best tailor their applications to fit their needs and the Blueprint resources available. CREATE Bio is split into separate discovery and development tracks. The Discovery Track is designed to feed into the Development Track with a minimal gap in time. As with BPN 2.0, SBIR FOAs supporting these two tracks are funded through the U44 mechanism. The CREATE Bio Discovery Track supports the optimization of therapeutic leads showing convincing proof of concept. At the end of the funding period, projects that successfully advance through this program will have identified a optimized candidate, which has sufficient bioactivity, stability, manufacturability, bioavailability, in vivo efficacy and/or target engagement, and other favorable properties that are consistent with the desired clinical application, and will be ready for entry into the CREATE Bio Development track. The CREATE Bio Development Track supports IND-enabling studies for the candidate and early-phase clinical trials. At the end of the funding period, a successful project should have an IND application submitted to the U.S. Food and Drug Administration (FDA), at a minimum. The program supports early-phase clinical trials, although these are not required components of proposed projects. 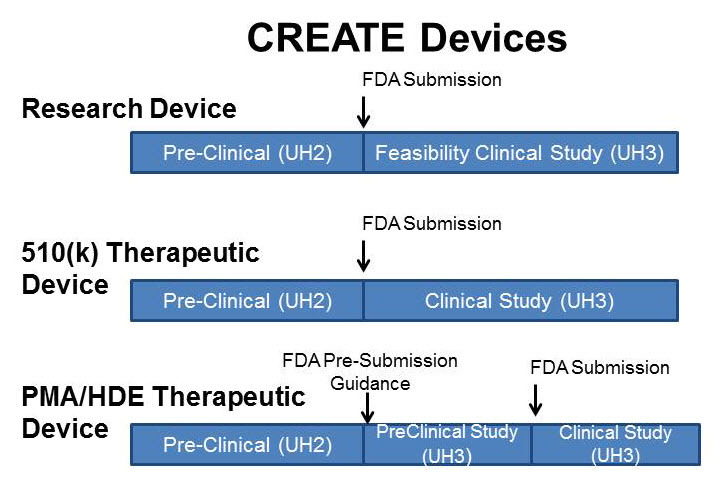 CREATE Devices:Three FOAs (Research Device, 510(k) Therapeutic Device, and PMA/HDE Therapeutic Device) are offered in CREATE Devices. They provide separate technical requirements at program entry and separate plans for progression through different regulatory pathways. In general, the UH2 mechanism will be used for preclinical investigations and the UH3 mechanism will be used for clinical studies. I hope it can make contributions to the chronic toxicology study.